Holiday ad campaigns are traditionally full of splashy red-and-green sales graphics, packs of kittens singing Christmas carols, and glowy montages of just how happy we could all be if only we got each other a gift from Company X. After all — there’s a ton of money up for grabs as consumers shop around for gifts, leading most companies step up their advertising games to an extreme level. In a bid to stand up from the competition, the holiday advertising season also brings with it a plethora of contenders for the cutest, funniest, heartwarming-ist and viral-ist campaigns of them all. There are the classics, like Coca Cola’s polar bears. There are the instantly iconic newcomers, like Starbucks’ red cup campaign. Don’t get me wrong — I love a good holiday campaign. But the frantic energy of the season can get a little overwhelming. Which is why my eye has been caught this year by four companies that are doing things a little differently. Instead of diving into the chaos of consumerism, they’ve chosen to offer us all a bit of breather. A moment’s peace in the midst of list-making, shopping, and entertaining. So sit back, relax, and unwind from all the chaos of the holidays with these great holiday campaigns. Instead of a barrage of visual imagery, viewers see a soft white screen, while a soft-spoken man with a soothing British accent tells us to relax and enjoy a break. Thank you, KitKat. I will. This “anti-holiday” campaign is turning the traditional Black Friday sale on its head. For the second year in a row, outdoor retailer REI has chosen to close its doors on Black Friday. Instead, customers and employees are encouraged to spend the day outdoors with friends and family. What makes this campaign work is that it resonates deeply with the core values REI stands for. Rather than using the day in a race-to-the-bottom attempts to grab a share of consumer spending, REI is choosing to take a gamble that this will foster goodwill with its customers. 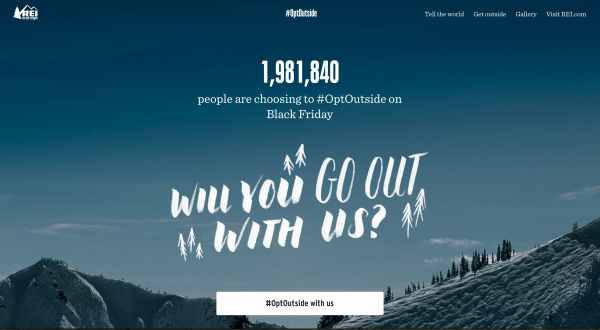 If the fact that nearly 2 million people have already pledged to spend Black Friday outside instead of shopping is any indication of customer loyalty, REI’s gamble seems to be paying off. And, as Percolate reports, it was the second highest-performing campaign around Black Friday. I guarantee this video will be playing in the background of at least one holiday party you attend this year. Riffing off the traditional Yule Log channel that has always graced my grandmother’s TV set during our Christmas Eve gathering, Lagavulin filmed a 45 minute video of actor Nick Offerman sitting in a leather chair next to a crackling fire, quietly sipping whisky. It’s a pairing made in heaven. Offerman’s trademark manly outdoorsman persona and oft-professed love of whisky make him the perfect spokesperson — or, I guess, non-spokesperson — for the brand. Folks, the truly future is upon us: TGI Fridays’ latest holiday campaign is out on Oculus Rift. The company is treating virtual reality users to a 360-degree sled ride through Lapland this season, complete with festive holiday music. I’m not on the Oculus bandwagon yet, but just watching the video on YouTube is totally delightful. Treat yourself to a break! What are your favorite holiday ad campaigns this year?